Expand the reach of your SiteController through existing wiring using our unique two-wire communications technology. 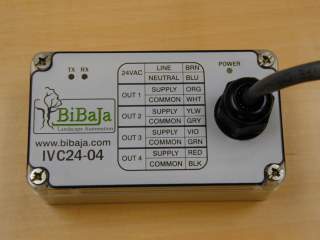 Each IVC24-04 two-wire expansion unit adds 4 zones through a single pair of 24VAC wires. The SiteController supports up to 32 IVC24-04 units. Out of wires in the field? No problem. Turn an existing pair of wires into 4, 8, or more new zones with multiple IVC24-04 units (depending on wire gauge). No need to trench back to the controller to lay new wires. The IVC24-04 4-Zone two-wire expansion unit provides 4 solid-state outputs for reliable control of irrigation zones, ornamental fountains, and landscape lighting. Control of ornamental fountain pumps and landscape lighting requires external relay with 24VAC coil (relay not included).